The 42 metre superyacht Lalibela has been severely damaged after a “major fire” broke out on board. 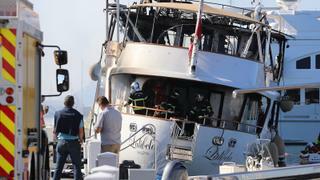 Firefighters were called to the Benetti superyacht in Vallauris harbour near Cannes, France at around 3am on Saturday October 13. The fire was still not extinguished by Saturday afternoon. 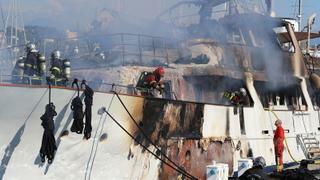 The blaze is reported to have destroyed the top deck and cabins inside, according to the Maritime Bulletin. A video posted on Instagram shows the yacht fully ablaze and firefighters present in the harbour. Two people were reported to be on board when the fire broke out but are understood to have left the boat without injury. However, two firefighters were injured while tackling the blaze and suffered ringing in their ears following an explosion. The yacht remained berthed during the incident while neighbouring yachts were moved to safety. The fire service also deployed floating pollution booms into the harbour. Built in 1972 and refitted in 2013, Lalibela could accommodate 12 guests in six cabins, as well as 10 crew. She had a top speed of 15 knots and maximum cruising range of 3500 nautical miles at 13.5 knots.